The story: After the shocks of episode 1 - Joe Miller (Matthew Gravelle) pleading not guilty and DI Hardy (David Tennant) hiding the ex-wife of Sandbrook murder suspect Lee Ashworth (James D’Arcy) - and the Shakespearean gathering of the cast at poor, murdered (and now exhumed) Danny Latimer’s grave, episode 2 examines Joe Miller’s trial and DI Alec Hardy’s foolish mission to put right the mistakes he made in Sandbrook. 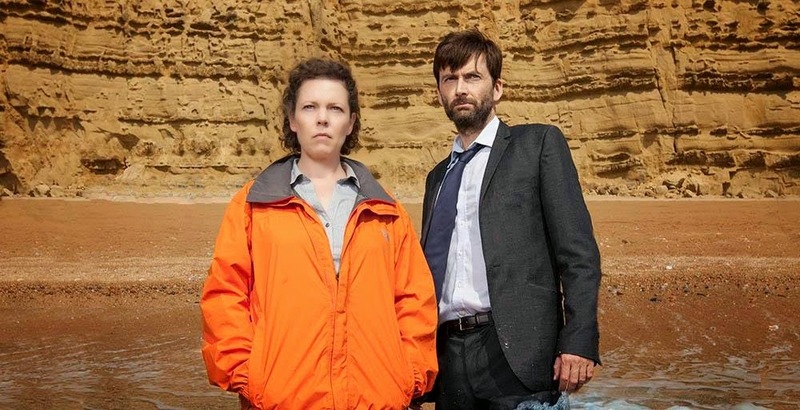 All drama to some extent requires the willing suspension of disbelief on the part of the viewer and none more so that this episode of Broadchurch. There have been some typically pedantic comments in the Twittersphere about legal procedure and rightly so. We know in real life that a court case would never happen so quickly on the heels of an initial (and shocking) not guilty plea. We also know that a witness is not allowed to sit and listen to a case in open court before they have given evidence. If writer Chris Chibnall does this, it’s possibly because 1) who would want to watch a drama about a year-long wait for a court case and 2) it all adds to the dramatic tension. If it’s all technically and legally nonsense, then let’s be big about it and let it go in order to follow the narrative. However, this is where episode 2 of series 2 really does challenge the viewer in a way that we really can’t move past so easily; the final denouement showing Hardy’s cack-handed attempt to entrap Lee Ashworth while Beth Latimer’s (Jodie Whittaker) waters dramatically break all over the streets of Wessex as she confronts former friend Ellie Miller (Olivia Colman). It had all started relatively well, too. Judge Sonia Sharma (Meera Syal) was decent and full of empathy right before dismissing Joe Miller’s confession on the grounds of police brutality (wife Ellie did a “Bruce Lee” on him), blowing a massive hole in the prosecution’s “wall of evidence” against him and leaving poor Beth Latimer to explain her husband’s affair and throw enough suspicion over him to perhaps give a jury cause to find Joe not guilty. Alec Hardy was outed in the press as “Britain’s Worst Cop” and he does a sterling job of living up to the title here. The notion that any cop with more than a single working brain cell would think that his crackpot idea to use Claire (Eve Myles) (a woman he’s painstakingly hidden for seven months, let’s not forget) to get former husband and creepy hill-stalker Lee to confess to murdering the two young girls in Sandbrook was in any way good is just staggering. As Hardy sets up the meeting in Ellie’s former marital home, you watch in the certain knowledge that it is doomed before it starts, even before the distraught and heavily pregnant Beth Latimer waddles into view. True enough, with Ellie and Hardy distracted, Lee and Claire disappear without a trace and the credits appear. It’s all a bit soap-opera-ish and not the most satisfying ending to an episode in what has been up to now a very high class drama that has brought us enough drama, emotion and character to keep us watching for a second series. It wasn’t all over-stretched drama, though. There’s a particularly poignant scene between Claire and Ellie as they share stories about the murderous husbands and how they first met over a bag of chips. Ellie convinces Claire to help Hardy in order to put things right; something Ellie herself desperately wants to do. There’s enough here for us to tune in for episode 3 to see what’s happened to Claire and where Joe’s trial will go next, as well as the repercussions on those who surround them. let’s just hope that we don’t have to suspend our disbelief quite as much as we’ve had to this week. Awkward Moment of the Week Ellie’s knock-back by the SOCO officer who’s now, erm, seeing someone. Questions, questions, questions Was Becca Fisher this much of a sexpot in series 1? What is it with that bluebell? Creepiest moment Lee Ashworth on top of a hill telling Alec hardy he wants his life back before uttering the sinister “Sorry about your health” line. Best line Beth Latimer to QC Jocelyn just before the trial, “None of us have got anything left to hide?” Oh, do you bloody think so?